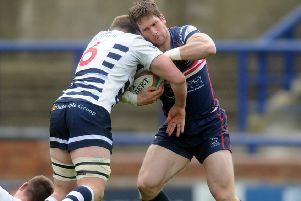 YORKSHIRE Carnegie boss Chris Stirling expects his side still to be bottom at Christmas but says funding is in place to make sure the club pull away from the relegation zone in 2019. They have won just one of their opening five games so far and things aren’t likely to improve any time soon given today they visit Championship favourites London Irish, the team relegated from the Premiership. Where once Carnegie hoped to be challenging for promotion themselves, now their predicament is far different at the other end of the table. Granted, they have been beset by injuries and have a small squad, but Stirling says that will be remedied imminently. “We’re massively further down the line now (with signings),” said the Kiwi. “We’ve been waiting for the Board to tell us the funding is in place before we push the button. “But it is and the button’s been pushed now. “We can expect to see some signings announced if not next week then certainly the week after and and it’s exciting times. “A couple of decisions are going to be made regarding programmes we’ll be putting in place for 2019-2020 and 2020-21. “Essentially, then, round 10 of this campaign – Doncaster Knights on December 29th – will be the start of our ’19-’20 season. “We’re more than likely still going to be bottom post round nine but with the strengthening of the squad I feel we can get up to mid-table from round 10 to 22. Carnegie host London Scottish on Friday, then head to Coventry the following week before the competition breaks for six weeks of Championship Cup action. Irish have won all four games so far and Stirling admitted: “We’re going down with the attitude of trying to challenge them. “They are the number one ranked team in the competition but it’s exciting and it will be a good experience for some of our young guys to face such quality opposition. Carnegie came close to breaking their duck when they lost just 28-21 at home to Bedford Blues on Sunday. “I thought we were the better team,” said Stirling, who makes five changes this afternoon. “We played all the good rugby – and all the bad rugby, too. Scrum-half JB Bruzullier returns to the starting line-up in place of Oli Fox, who is named on the bench. The rest of the changes come in the pack with loosehead prop James Thraves coming in for Rowan Jenkins. Lock Will Britton replaces Mike Myerscough who is ruled out with a knee injury. Tighthead Jake Ilnicki starts in place of Andrew Forster who is among the replacements and blindside flanker Elliott Ward comes into the first XV for Trystan Lloyd who is missing with a knee issue, too. he bench, Will Vaughan returns from Bath.